Even after being a biology watcher for decades, I learned something very interesting a few years ago when I chanced upon a group of hawk watchers one September afternoon at Saddle Gap on the Blue Ridge Parkway here in Floyd County. As I approached, one of them, looking overhead through binoculars called out: “It’s a green darner!” That was the first I’d ever heard about dragonfly migration. The next fall, glancing up at dusk to see the regular night hawk performance high over our rooftop, I saw them—hundreds of large dragonflies, their sudden appearance and vast numbers centered over our house was frankly a little eerie and shocking. Thank you, Alfred Hitchcock. The next evening, they were gone. More is known now about dragonfly migration because transmitters have become so miniaturized they can be glued under the thorax of a dragonfly without impairing movement. Travel dates and flight paths of these tagged individuals can now be recorded from airplanes. While many questions remain, some interesting details have emerged. The green darner (so called for its back-and-forth knitting needle flight path) is a robust common dragonfly, and one often seen passing through in large numbers in September in southwest Virginia. 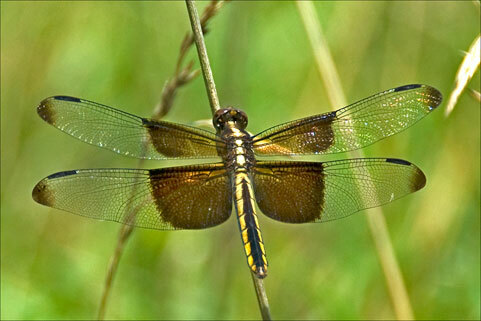 It is a species that represents one of the dozen or so migrators from the 400 known dragonfly species. But only a portion of the whole population of green darners will leave in the fall for some yet-to-be-determined locations to the south. The rest will overwinter in their immature stages in ponds and streams—even under ice—and emerge the next spring as the migrants return to lay eggs and die. The migrants in the eastern US follow pretty much the same flight schedule and paths as migrating hawks. In particular, there is a good match between the patterns seen with American Kestrels (sparrow hawks) and dragonflies. During the daytime, hawk and insect fly the same route while the thermals contribute to covering the distance. When the even cools and the thermals wane, the hawks descend to feed on the dragonflies. The dragonflies, in turn, feast on a wide variety of insects, including mosquitoes, gnats, midges and beetles. However, in the fall, out of the aerial plankton, part of their diet shifts to winged aphids. While these wispy insects are extremely small, they are rich in sugars and fats from their feeding on plant juices from our garden, field and forest all summer. A dragonfly gorges on the slow flying insects, and in turn, becomes a meal for a fast flying raptor. From their aquatic larval diet of mosquito wrigglers to their adult diet of insect pests of plants and people, dragonflies as a group provide a service to mankind that we do not pay for, and frankly, like so many such “environmental services”, we take for granted. Consider the total value of pest control we humans get “for free” from this marvelous, big-eyed hunter. We lose this benefit when ponds go dry from drought or wetlands are drained because they are there, or we use pesticides irresponsibly near water. Let’s return briefly to the matter of dragonfly migration, and a discovery only made public in 2009 after years of observation. A biologist stationed on the Maldives—a remote island chain in the Indian Ocean—had wondered since 1996 where the millions of dragonflies that visited only briefly every year might have come from and where they were going. What he found was that, while it takes four generations to make the trip there and back, huge numbers of dragonflies leave India following the annual weather systems, pass over Maldives on their way to eastern and southern Africa—a round trip of up to 11 thousand miles! This far eclipses the former insect migration distance record held for so long by the familiar Monarch butterfly. So when you spot a September dragonfly—or hundreds of them—realize there is a much richer, deeper and wider story here than we have realized or appreciated—and think of this as just one more instance of the benefits we gain from the nameless creatures always working in the perpetual background management of planet Earth. Fred, have been watching the glorious green darners here for the last week or two and will feel sad when they are no longer to be seen on our hill in the Lanark Highlands. They are truly one of Gaia’s wonder, and thank you for this most informative post. A SUPER lady in Arizona, Chris Goforth, is doing a study on dragonfly migrations. She’s got a terrific website that you might enjoy. http://www.dragonflywoman.wordpress.com. Check her out.